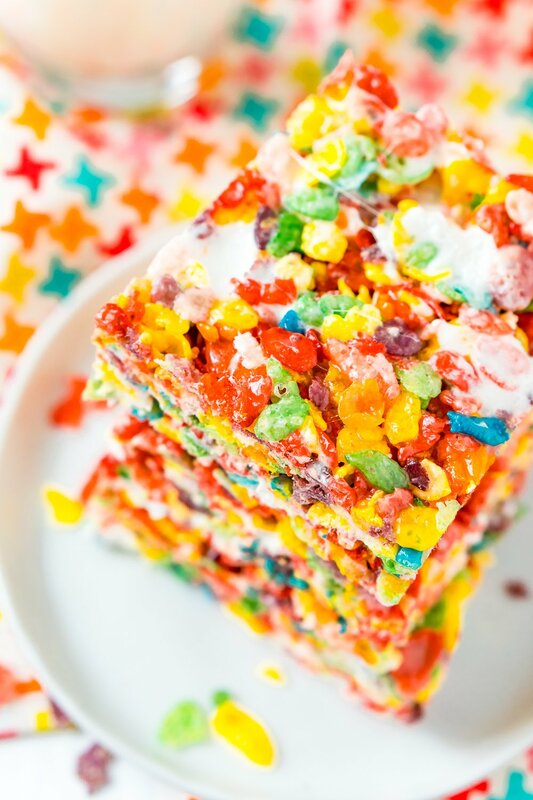 These Fruity Pebbles Treats are a fun and fruity twist on the classic no-bake dessert made with Rice Krispies cereal. They are made with the perfect blend of cereal, butter, and marshmallows and take just 7 minutes to prepare! 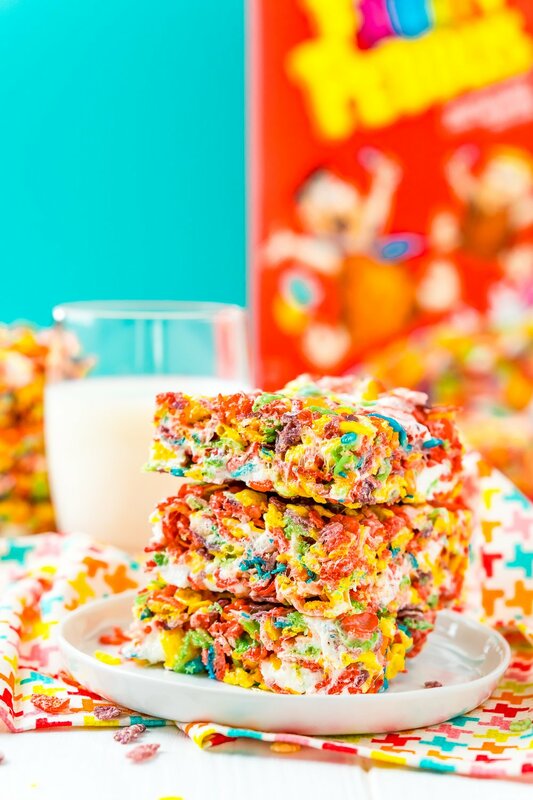 There’s nothing like a nostalgic treat that’s reminiscent of your childhood, and these Fruity Pebbles Treats definitely fit the bill! Love Rice Krispie Treats? Love Fruity Pebbles? Yep, you’re going to love these! Personally, Fruity Pebbles were my favorite sugary cereal growing up. And when I was a kid, my Nana used to make Rice Krispie Treats for after school snacks. Needless to say, these Fruity Pebble Rice Krispie Treats bring me right back to my younger days. If you have kids (or grandkids), you can start your own tradition, too! 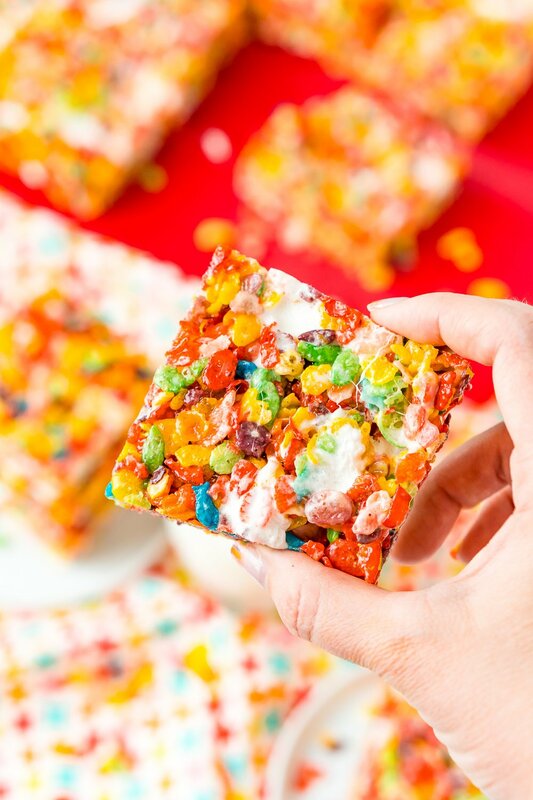 You only need four ingredients to make Fruity Pebbles Rice Crispy Treats, and they require no baking time. Simply melt butter and marshmallows in a pot on the stovetop, then mix in cereal and vanilla and the remaining marshmallows. Next, transfer the mixture to a pan, cool — and you’re done! 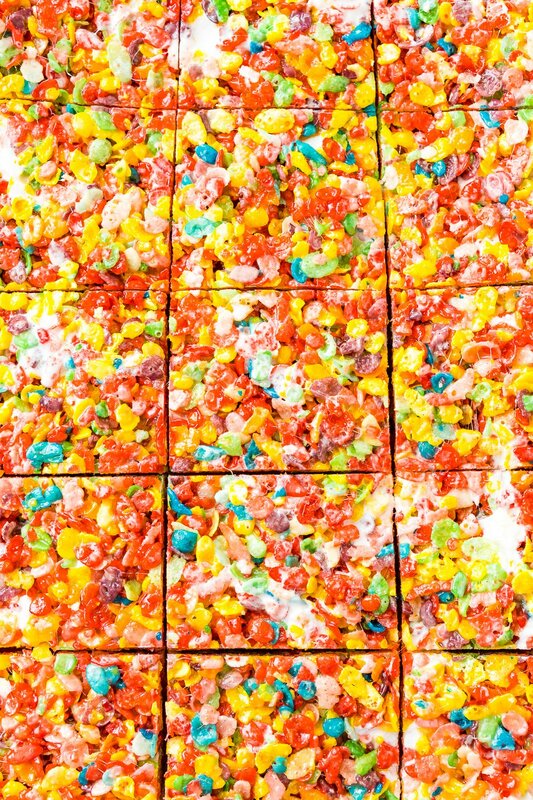 There are a few tricks to making Fruity Pebbles Marshmallow Treats come out perfectly. 1. 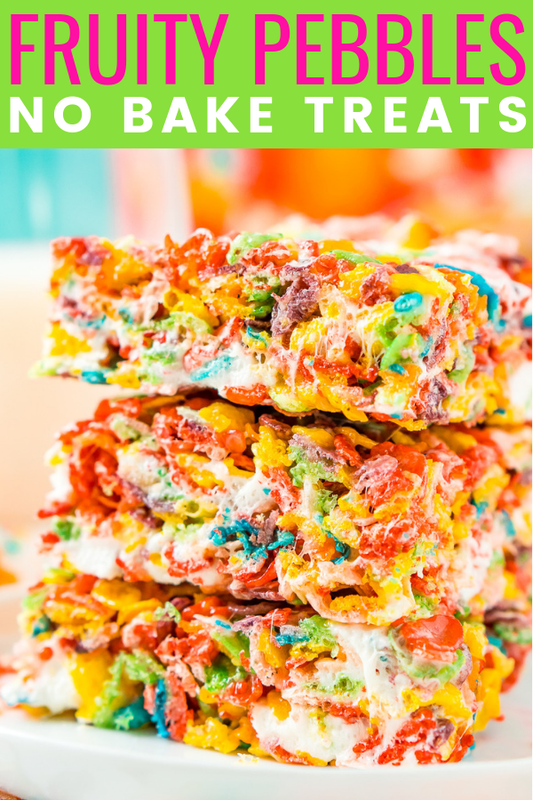 Use Fresh Cereal: No Bake Cereal Treats are not a good way to use up stale cereal, so do yourself a favor and throw the stale box in the trash and use fresh cereal in this recipe! 2. Coat your Hands with Non-Stick Spray: This helps prevent your fingers from sticking to the treat mixture and makes it easier to handle when pressing it into the pan. 3. Don’t Press Too Hard: You want your treats to be firm, but still chewy. Pressing too hard on the mixture when you put it in the pan will cause treats to become tough. 4. Pick Your Butter: Normally will sweet treats you use unsalted butter, but when it comes to no-bake cereal treats, I prefer to use salted, because half the deliciousness is from the salty buttery taste. However, you can use unsalted and add salt as needed or sprinkle the treats with sea salt just before serving. 5. 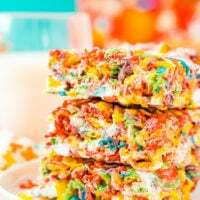 Add Vanilla: This isn’t an overly common ingredient in Fruity Pebbles Treats, but it should be because it amplifies the flavor of the marshmallows and makes them taste that much better! 6. Reserve Some Marshmallows: I don’t like to melt all of my marshmallows into the mixture, I always reserve 2 cups to go in with the cereal because this leaves little pockets of marshmallow goodness throughout the treats. You can add in a couple more cups if you really want to load these babies up with marshmallows! 7. Slice Just Before Serving: To ensure that your treats to get dried out or crispy around the edges, slice them just before serving! With warmer weather around the corner, these no-bake goodies are perfect to enjoy in the summertime. Plus, they’re easy to grab and go, so you can serve them at get-togethers all season long. 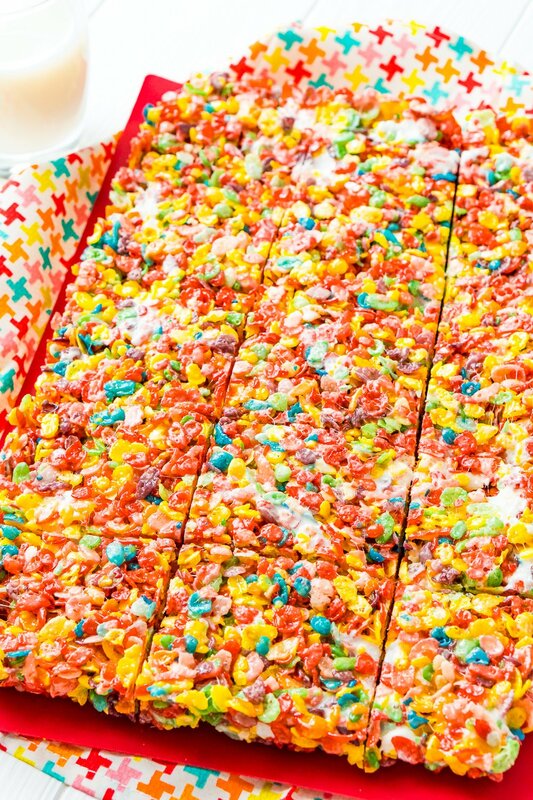 Birthday parties, graduation parties, Fourth of July gatherings, as an afternoon pick-me-up… really, there’s no wrong time to enjoy this Fruity Pebbles Treats Recipe. Are Fruity Pebbles Treats Gluten Free? Yes, as long as you use a gluten-free marshmallow, they are! Kraft Jet-Puffed is gluten-free, but if you use another brand, be sure to check the ingredients. Kids love these fruity, chewy, crispy snacks because they’re colorful and tasty. Adults love them because their favorite childhood cereal (and after-school snack) has been reimagined. And speaking of reimagined cereal treats, you have to try these recipes for Cap’n Crunch Treats and Cocoa Puffs White Russian Cocktails, too! 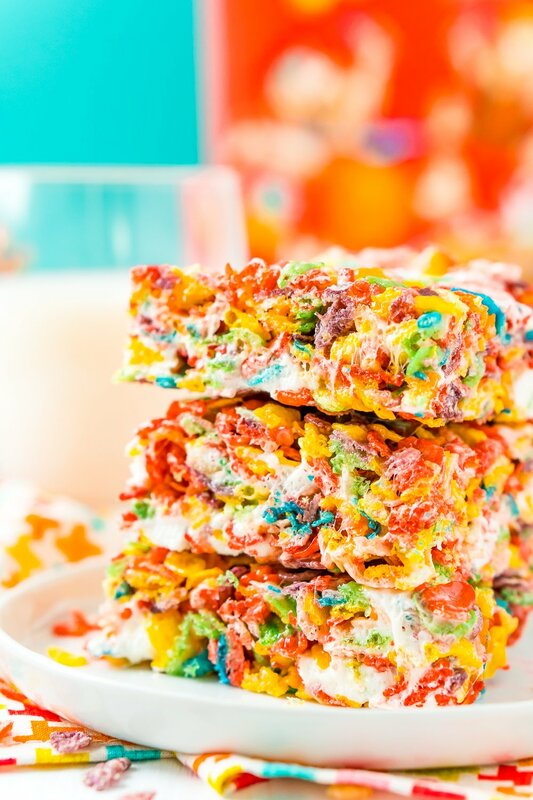 If you’re ever in need of a quick, easy, no-bake recipe that’ll please crowds, make a batch of Fruity Pebbles Treats to share. In fact, you may want to double the recipe because they won’t last long! Line a 9x13-inch baking dish with aluminum foil and set aside. Melt the butter in a large pot, once the butter has melted, add in 8 cups of the marshmallows and stir continuously with a wooden spoon or rubber spatula until the marshmallows have melted. Remove from heat and add in the cereal, vanilla, and the remaining 2 cups of marshmallows and stir until the cereal is evenly coated. Transfer the mixture to the prepared baking dish, spray your hands with non-stick spray and gently press the mixture into the pan, don't press down too hard or you'll end up with hard treats. Allow the treats to cool for about 20 minutes before removing from the pan and slicing into 24 pieces.